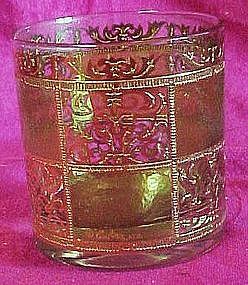 This great glass is very elegant with the lavish gold decoration and trim with alternation green boxes. Signed Culver. Measures 3 3/8" tall with thick bottoms. This is the "old fashion" or "rocks" whiskey glass. Add to your barware today! Excellent condition. I just have one available now.